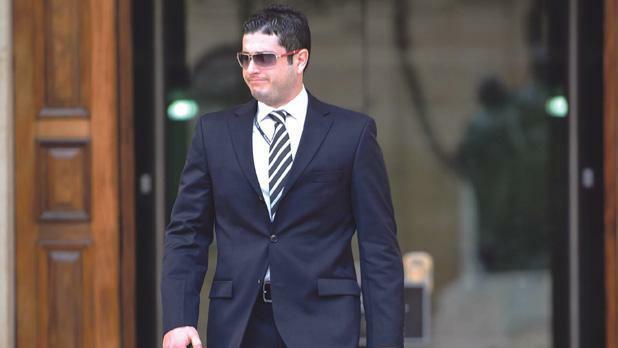 The former policeman who in 2016 was witness for the prosecution in the trial of David Gatt for the 2011 HSBC Bank heist, was committed yesterday to Mount Carmel Mental Hospital. On Saturday he posted a Facebook post in which he accused David Gatt and his former law office partner Chris Cardona of masterminding the assassination of Daphne Caruana Galizia. Mario Portelli, formerly PC99 in the police corps, was committed at his family’s request, police sources told this website. His video from last Saturday was seen 61,000 times according to Facebook. David Gatt was a police inspector at the time of the HSBC bank heist but was fired on suspicion of criminal activity. After his acquittal at his 2016 trial, he successfully sued the government for compensation for unlawful dismissal. He now practices law in the courts. His personal friendship with Economy Minister Chris Cardona goes back several years. Chris Cardona signed David Gatt’s recommendation for his acceptance to the bar and before that David Gatt underwent his compulsory law practice in Chris Cardona’s law office. David Gatt’s name was brought up when two of the three persons accused of being the hitmen that killed Daphne Caruana Galizia were identified. They had been accused of being part of the gang that David Gatt was accused — and acquitted — of leading at the HSBC heist. Chris Cardona was also named in connection with the assassination of Daphne Caruana Galizia. France 2 reported in April 2017 they spoke to witnesses who saw him meet one of Daphne Caruana Galizia’s assassins. In October La Repubblica then reported Chris Cardona attended a private party with one of the assassins even if he had denied knowing him. In his video from last Saturday Mario Portelli presented no evidence to substantiate his claim that David Gatt and Chris Cardona masterminded the assassination of Daphne Caruana Galizia. No comment has been forthcoming from any of the persons mentioned in the video. There is no way to assess whether Mario Portelli’s claims are backed by any knowledge or evidence he may be privy to. The video in and of itself does not add anything to suspicions that may be cast on Chris Cardona in view of any motive he may have had and his relationship or history with the alleged assassins and his, and allegedly their, associate David Gatt. However, the present situation does amplify the argument for an independent public inquiry into the assassination of Daphne Caruana Galizia and the subsequent handling of the case by the authorities. The nature of the assassination and the content of Daphne Caruana Galizia’s own journalistic work cast a natural shadow of suspicion on people in political power. All these politicians retained office after the assassination and continue to exercise absolute control on the police that are tasked with investigating the case. There is no suggestion that Mario Portelli’s committal to a mental institution is somehow involuntary or unjustified. However, the lack of transparency and the lack of independence in the investigations give no comfort that justice is being served. The family of Daphne Caruana Galizia has appealed for an independent inquiry for several months and has published legal advice from human rights specialists that support that claim. This episode adds reasons to that immediate need.